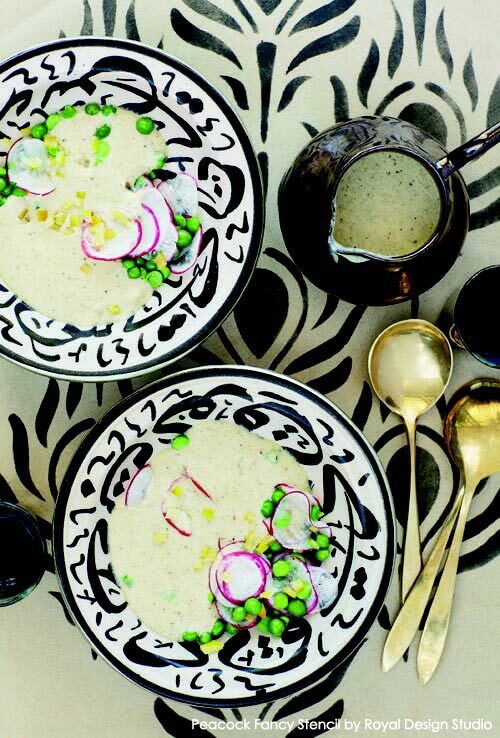 To style the event with famed chef Mourad Lahlou, Maryam used many of her own dishes and cutlery. She also stenciled the fabrics, including tablecloths, with her own cache of Royal Design Studio stencils.The photographs by Lisa Linder helped capture the flavor and style of the dinner party perfectly. The Peacock Fancy Stencil makes quite an impression in black and white! The versatile stencil design allows for an allover wallpaper pattern or singular motifs to be stenciled. It is available in two sizes to allow for both furniture painting and stenciling on larger surfaces. The Intricate Zelij Moroccan Stencil, also available in two sizes, makes a dreamy impression stenciled loosely with a hazy, lost-and-found technique. The large version of the pattern is stenciled on a yellow door at Peacock Pavilions! 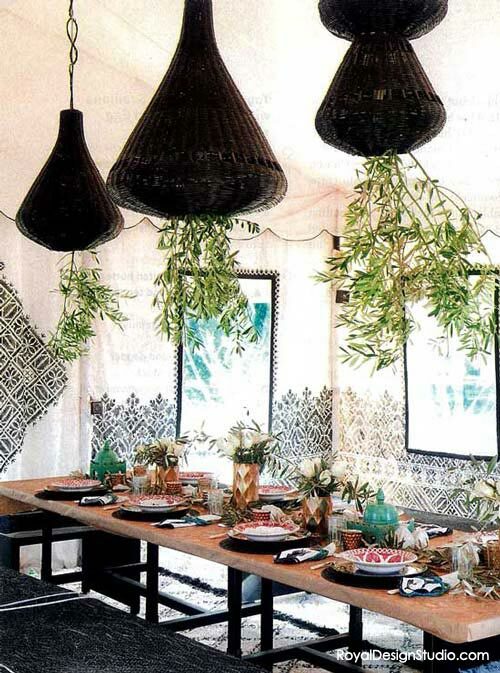 The dinner event was held in an intimate, stylish space — a sumptuous dining tent on the hotel’s exterior grounds. It was a beautiful experience for our group of Peacock Painters to stencil the large canvas tent, which was inspired by Moroccan Fez textile embroidery. The Moroccan Lace Stencil was designed with this project in mind, and has since become a part of our extensive Moroccan Stencils Collection. 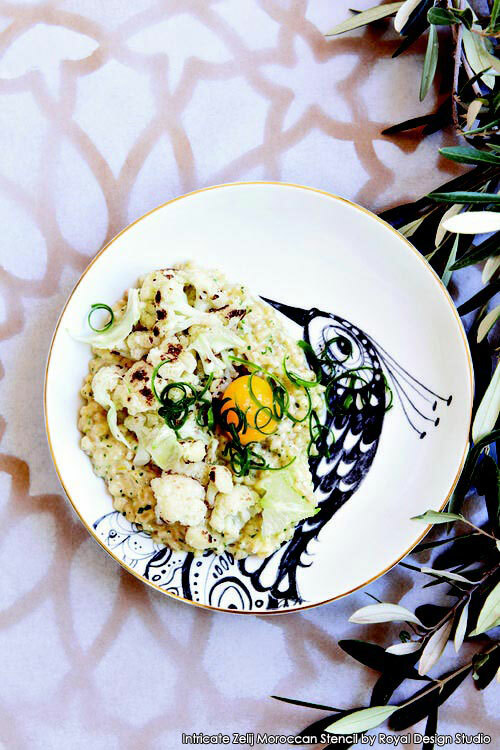 Maryam frequently holds frequent dinners and special events here, and it is always so lovely to see how she incorporates Moroccan design, stenciling and beautiful colors within each and every occasion. We have two more upcoming stencil painting tours scheduled at Peacock Pavilions and we hope to continue to share the incredible projects we create with you! We have MORE incredible images and ideas for your next project! 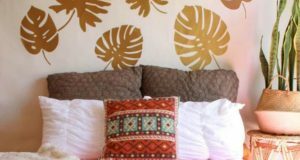 Love stenciled fabric ideas like the ones above? Check out our Fabric Stencils board on Pinterest! Keep up with our Marrakesh adventures and more in our globally-inspired blog, Paint + Pattern. 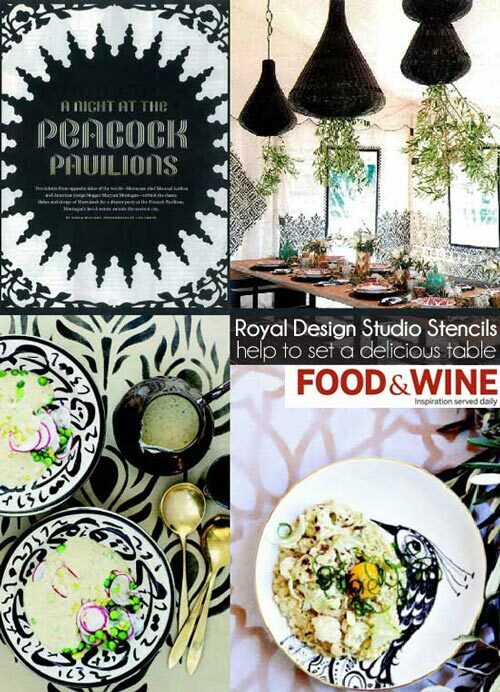 Marrakesh by Design is a “must” book for fans of Moroccan design! Share your stencil design inspirations with us on Facebook. We love to hear from you! Follow us on Twitter for updates from Melanie Royals and be the first to hear about great stencil sales! If you are searching for inspiration to guide you on your latest stencil projects, check out our Pinterest account. Be sure to join our Royal Design Studio community boards as well!